Restylane is a natural substance (hyaluronic acid) used as a dermal filler. 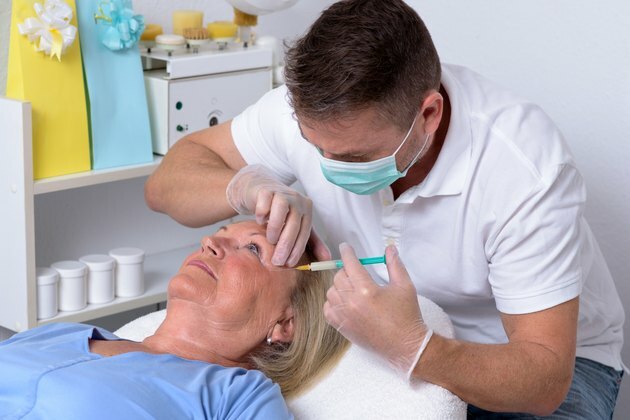 A dermal filler is a substance that is used to add volume to the skin to reduce the appearance of wrinkles and folds, especially near the mouth and nose. According to Drugs.com, as of 2009, Restylane is the only dermal filler approved by the Food and Drug Administration (FDA). It is available as a gel and is given via injection underneath your skin surface. This gel can degenerate on its own underneath your skin, and its results are immediately apparent. According to the National Library of Medicine, Restylane's most common side effects include pain, swelling, redness and inflammation at the injection site. Typically, this occurs due to the trauma of the needle being injected into the thin tissues of your face. These side effects should disappear within three to five days. The "Consumer Guide to Plastic Surgery" states that Restylane can also cause a headache, nausea and flu-like symptoms such as a runny nose. Inform your physician if these symptoms remain for more than five days. The National Library of Medicine indicates that Restylane can also cause swelling (edema) of your face. In some cases, Restylane may cause facial muscle weakness at the injected areas. Your face may appear to droop after a Restylane injection. If too much Restylane is injected, you may develop itching (urticaria), chills, nausea, vomiting, a fast heartbeat and low blood pressure (hypotension). Vomiting can cause dehydration and low amounts of potassium in your blood. A symptom of dehydration is less frequent urination throughout the day. Drink 5 to 10 glasses of water to rehydrate yourself. Cramping and muscle weakness may indicate low blood potassium. Eat foods that contain potassium, such as bananas and apricots. Low blood pressure can cause you to faint because not enough blood is going to your brain. Tell your doctor when you experience these side effects. Avoid Restylane if you are hypersensitive to hyaluronic acid or any other dermal fillers containing this substance. You can develop localized itching and hives. Do not get Restylane injections if you are taking furosemide, phenytoin or benzodiazepines, says the National Library of Medicine. Restylane can interact with these medications and bring about the aforementioned effects.